The FTSE100 is set to open higher today as the US Democrats took the House of Representatives but the Republicans appear to have held onto the Senate in the latest midterm elections. European and US equities remain supported suggesting this outcome is positive for risk with a higher probability of more fiscal stimulus by Trump. In the UK, Prime Minister Theresa May's Cabinet is on standby for fresh talks to agree a Brexit deal amid claims by pro-Leave members of her party that she has already reached an agreement. Footsie finished Tuesday at 7041 losing £63.12. The bears were in full control, moving the market lower throughout the whole session. 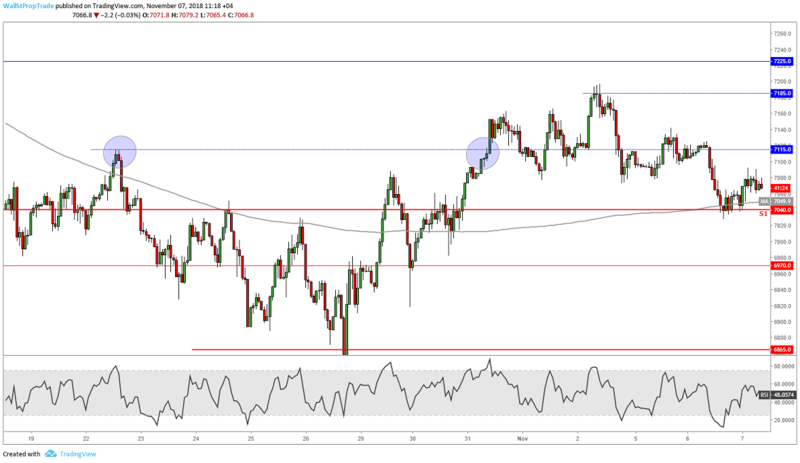 Prices are now close to the key technical support level at 7040 where a slight rebound is expected in the short term. However, a bearish Engulfing Candle is forming on the daily chart, which might pose a threat on the index on the longer term.